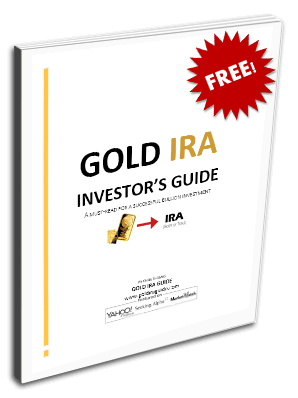 Gold IRA GuideIRA Recent Gold Price Drop, an Opportunity for IRA Holders? Recent Gold Price Drop, an Opportunity for IRA Holders? Whenever the price of an asset drops, a shrewd investor looks to see what was behind the decline. If the drop represents a reaction to a negative investment outlook for the asset, that is one thing; on the other hand, if the price drop stems from factors which are by and large unrelated to the asset’s value as an investment, it might be seen as posing a buying opportunity for those who believe in the asset’s longer term future. This seems to be the case in regards to the recent decline in the price of gold, which doesn’t appear to make sense given the strong outlook for the yellow metal in a world awash in loose monetary policy. This sentiment seems to be shared by the buyers of physical gold, who have flocked to gold merchants in the wake of the price plunge to purchase the metal. In light of this, it makes sense to take a closer look at gold’s sharp price drop in April and see what we can learn from it. One theory holds that gold’s recent price decline has a lot to do with the attempt to preserve the dollar’s value on the global markets. In these accounts, the fact that gold is seen by many to be an alternative currency to the dollar makes it a prime target for efforts to depress its price, making the dollar appear stronger by contrast. Central banks are seen as central to these price suppression efforts, given their desire to support the fiat currencies that they issue. While it is certainly true that gold, given its long history as a monetary metal, is seen by some as an alternative to fiat currencies worldwide, any effort to permanently depress the price of gold, by whatever party, seems unlikely to succeed, given the global interest in acquiring the yellow metal. In addition, with the Federal Reserve currently printing $85 billion a month via quantitative easing (QE), the ability of the dollar to hold its value against gold is handicapped by the rapid rise in new money being created as a result. While the paper price of gold has fallen as measured on futures exchanges such as the Comex, the demand for physical gold at current price levels has been so strong that purchasing it often requires payment of a substantial premium over the paper price. If this is the case, you might ask why the price of gold declined so far in the first place. A possible answer is that the paper gold exchanges such as the Comex and LBMA (London Bullion Market Association) operate on a fractional reserve system, which requires only a portion of the total gold represented by the contracts traded on these exchanges to actually be held in storage at any one time, and therefore allows price movements that may not necessarily reflect actual physical demand for the commodity at any one point in time. Given that most traders of gold and silver contracts prefer to settle their trades in cash and not the actual metal, in normal times this arrangement works smoothly. However, after the events in Cyprus, where deposits held with certain banks over a specified amount were lost, trust in the system as a whole seems to have been called into question to some degree. The resulting rush to convert unallocated gold (that held by a bank or custodian for investors in general) to allocated gold may be behind the drawdown of gold holdings at Comex warehouses seen recently. Whatever else it might mean, this shrinking of the supply of gold at major storehouses would seem to be a positive for the price of gold, on the assumption that lower supply often leads to higher prices. Reports of high premiums for physical gold and strong demand from around the world continue to proliferate. The World Gold Council reported that in the first quarter of 2013 central banks added more than 100 tons of gold to their holdings. It also reported strong demand for gold and gold jewelry from China and India in the first quarter, as well as in the US, where demand for gold coins and bars was up 43% on a year over year basis in the first quarter of 2013. Given the various factors tending to demonstrate that the recent plunge in the price of gold doesn’t necessarily stem from a poor outlook for the precious metal, it could be seen as an opportunity for IRA holders looking to diversify their portfolios.